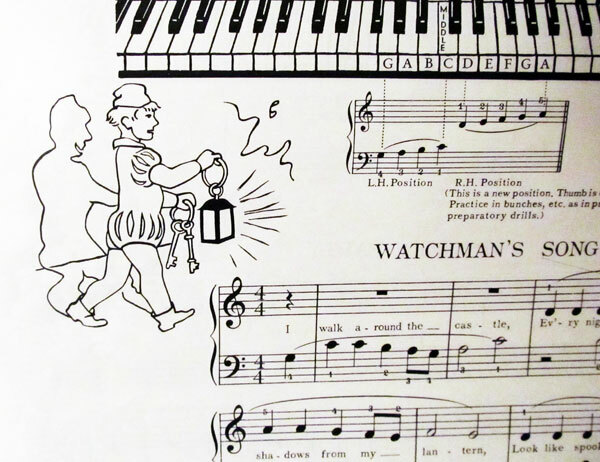 Tonight, Little Mister practiced "Watchman's Song" on the piano, my favorite song from the Green book. Hearing it, I was suddenly ten years old again, and playing the whimsical little song for the first time. I have no idea where the song or the poem came from, but the few simple words ignited my imagination as a child. I walk around the castle, every night at twelve. The shadows from my lantern look like spooky elves. What stories those eighteen words built in my mind! I pictured a medieval castle, chilly and drafty, and a young man, intent on his job responsibility. He would begin his rounds, fear gripping his throat as he haltingly stepped through the darkness. That kind of delicious terror that raises the hair on my arms would come over me as I thought of this frightened lad, creeping along a tall stone wall in the silent darkness, the flickering, dancing shadows following him and harassing him, catching at the corners of his gaze to tempt him to look at them. Even at age ten, I loved the sound of those words in the second line, and the gentle cadence of the musical notes. 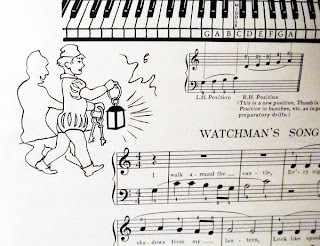 Even now, hearing the song makes me want to write stories, to craft these musical words into tales that bring to life the scared, creeping little watchman and his flock of spooky elves.